I've spent the past few days reflecting on the past year... the challenges, the highs and lows, and of course, the celebrations. I like taking a few days at the close of the calendar year to disconnect and prepare for the new year ahead. 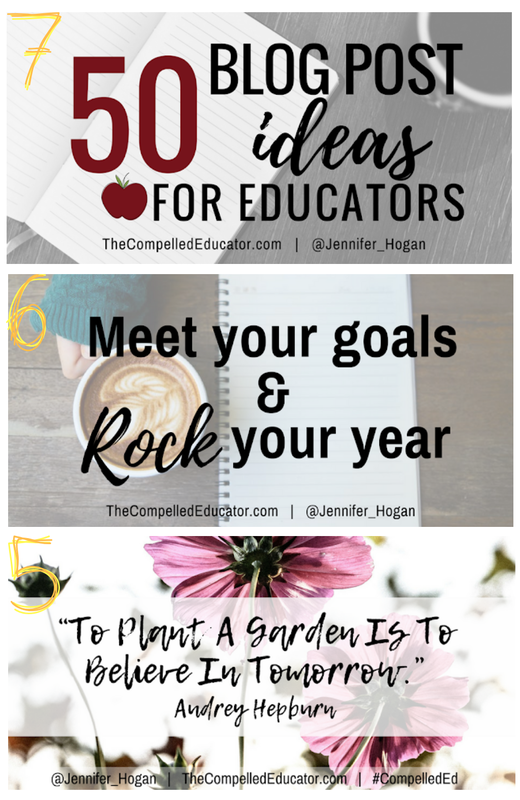 As for me, I do a lot of visualizing, writing goals, and crafting my three words for the new year. Part of looking ahead for me is looking back. There are mistakes I want to avoid repeating, skills I want to continue to grow, and relationships I want to continue to cultivate. As a recovering perfectionist, my need to review events is becoming more about learning and less about judging. I'm so grateful for all of you who read and comment on my blog posts. 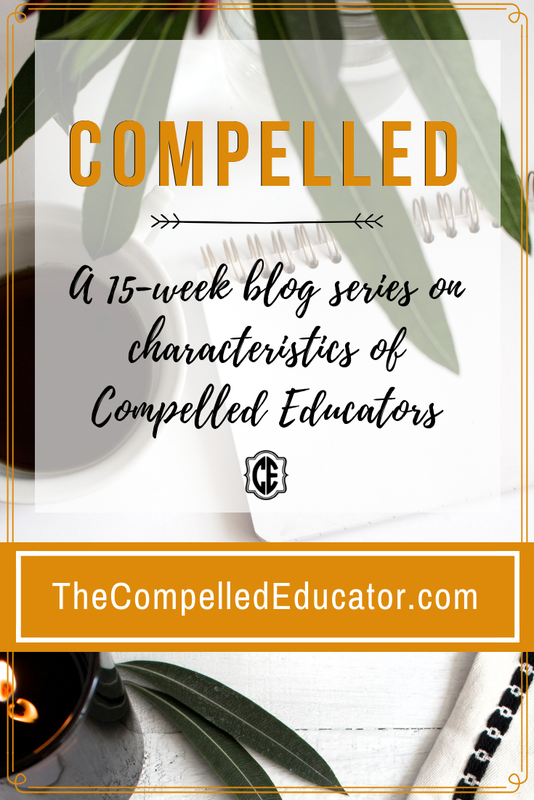 I love being a part of the Compelled Tribe, the community of bloggers that I lead along with Craig Vroom and Jon Wennstrom. I've learned so much from all of the interactions on twitter and through blogging with the tribe members as well as many other talented writers who push my thinking and contribute to my personal and professional growth. Thank you for being a part of my 2018. I hope all of you have a wonderful new year! 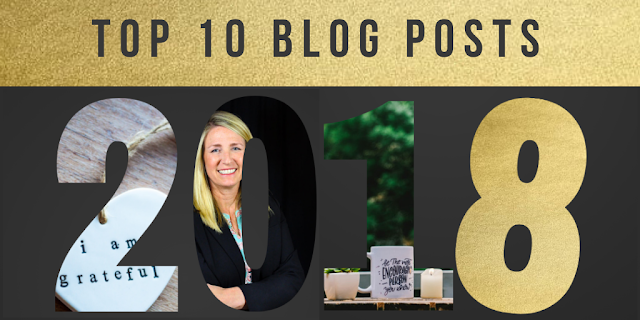 If you're a blogger and write a Top Ten round up, please be sure to tag me on twitter! Welcome to the final week of a 15-week series where I share quotes, examples, and/or stories about 15 of the characteristics that I believe are demonstrated by Compelled Educators everywhere. I'm a huge fan of school. I loved all the schools I attended... elementary (I went to two elementary schools), junior high, and high schools (I went to two high schools). I had a rough time when my daughters got to middle school and high school, because they didn't enjoy school like I did. Actually, they didn't enjoy it very much at all. My youngest daughter disliked school the most, and much of why she didn't like school is because she didn't like having to "do school." She loves to learn and can tell me a lot about many subjects, but she definitely didn't like the school procedures and rote learning that she was required to do. Both daughters talked to me about their teachers and lessons in their classes. 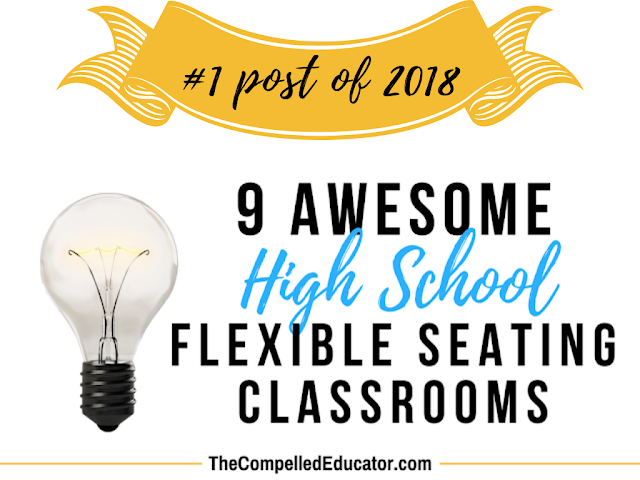 They both had a few classes that they enjoyed, and the common denominator in all of the classes is a teacher filled with joy. These weren't the teachers who always made the classes "fun," but they were teachers who were excited about what they were teaching, who celebrated students and enjoyed the company of their students, and made their classrooms inviting. 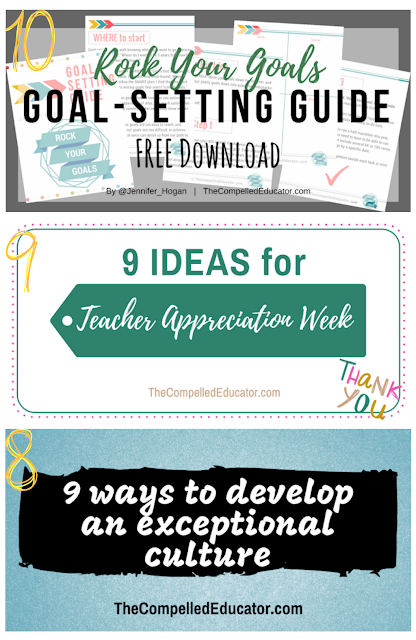 These teachers loved to learn and loved when their students were learning. They believed in their students more than the students believed in themselves, and they encouraged their students to keep learning, growing, and striving for excellence. These teachers not only possessed joy, but they knew how to bring out the joy in the students and through their learning. In an article by Nancy Barile, Building a Joyful Classroom: Top 10 Strategies Based on Education in Finland, she shares tips for blending joy and learning in a classroom. Set and keep work-life boundaries (Here's an article I wrote for NASSP on self-care for educators). Disconnect, recharge, and learn to say no. Know each child. Learn about their lives outside of the classroom. Greet them by name. Build strong relationships. Provide choices that allow students to make connections between content and their personal interests and passions. Create assignments where students have to prove their learning. Have them to defend their choices and answers and "show their work." Courageous Leadership is not bravado. It’s leading from the heart, and aligning one’s actions with beliefs. It’s doing the hard stuff because it has to be done, and being truthful through the process. I believe it’s one of the most important qualities of a leader. Below is a collaborative post from Dennis Griffin and me. Dennis reached out to me on Voxer after reading my e-book, and after a few conversations, we knew that we wanted to create an opportunity to collaborate with others around the action of facing our fears as we lean into courage in the new year. We hope you will join us! 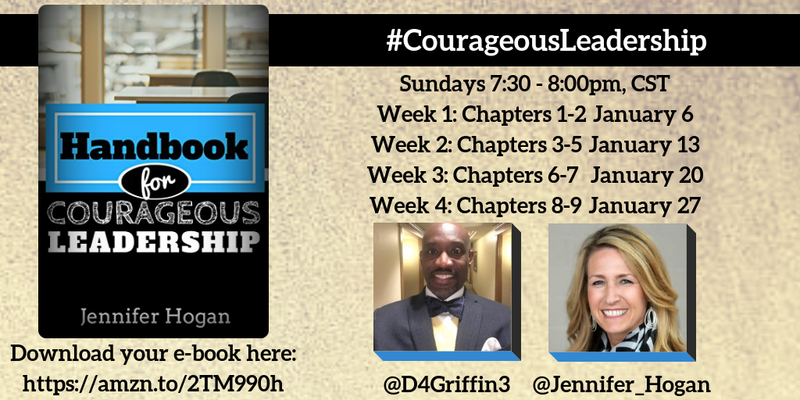 I (Jennifer) used to think that courageous leadership meant being willing to make decisions that people wouldn’t like. Also, in my naivety, I thought that courage was something that had to be summoned up… called for, if you will, before doing the things that others didn’t want to do. Now, as I have grown in my leadership experience because of my connection with others via my online P²LN, I realize that courage is not the opposite of fear. We all have fears, and we can all be courageous. As I have explored the concept of being a courageous leader, I had to research fear and how fear drives many of the decisions we make as humans and social beings. 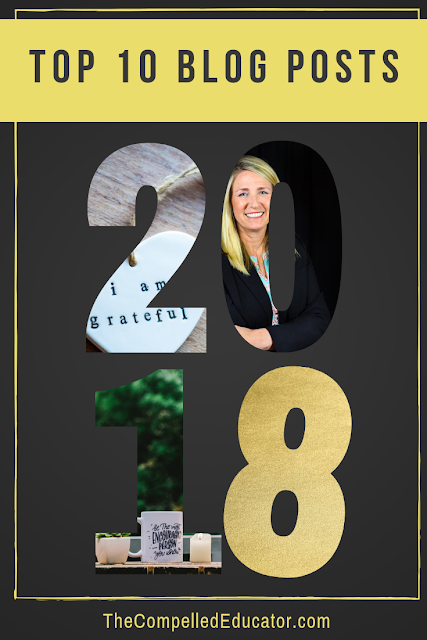 Being able to share what I have learned through my writings and empower others through coaching to name, claim, and face their fears have been some of the most rewarding experiences of which I have been a part. I (Dennis) have to admit the media had greatly influenced what I thought Courageous Leadership was. Courageous Leadership had been depicted as the protagonist looking fear square in the eye and overcoming conflict that had a definitive right and wrong. Of course, in the movies, the protagonist was always on the side of righteousness. Our world has taught us that righteousness is not always the determining factor in what many deem as leadership. Power, privilege, and personal perspective have often dictated decisions that have not necessarily served the greater good. On my leadership journey I have questioned, how was it possible for so many individuals to take the same leadership classes, read the same leadership books, and turn around and allow so many injustices to go unaddressed and empower the status quo? Gus Lee, the author of Courage: The Backbone Of Leadership, may have summarized what stops courageous leadership when he stated, “being isolated in a relational society feels like death.” We live in a society where people want to belong to something. I can remember as a student there were times when I acted differently to be accepted by my peers. I am glad that I experienced that for now I truly appreciate being the authentic version of myself. Along with Jennifer and the book study group, I hope to answer this question: Is it possible that our ability to empower others (which I believe is the highest level of leadership) to make change is directly connected with our fears of how we think society will judge us? 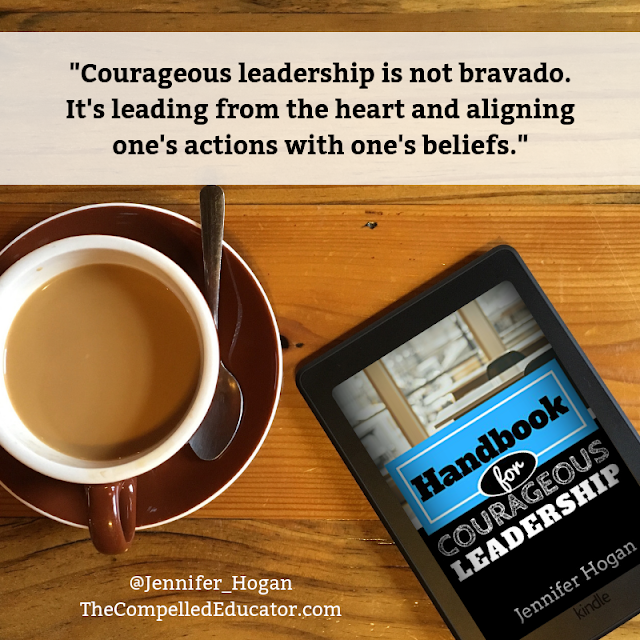 To create a space to learn and share about Courageous Leadership. To build our capacity as Courageous Leaders. Develop a #PLN of Courageous Leaders to counter the effects of isolation. One way or another, your leadership will make a difference by creating change or by reinforcing the systems that are currently operating and defining our world. Fear, doubt, and conflict will always be present as you begin to venture into the unknown; however, your Courageous Leadership is not just for you. Your Courageous Leadership can potentially create a life altering difference in the lives of those you serve on our journey to a better tomorrow. We hope you will join us as we kick off the new year facing our fears! Lee, G., & Elliott-Lee, D. (2006). Courage: the backbone of leadership. San Francisco, CA: Jossey-Bass. Welcome to week 14 of a 15-week series where I share quotes, examples, and/or stories about 15 of the characteristics that I believe are demonstrated by Compelled Educators everywhere. 1. Making something or someone a priority and doing so in small and discrete but meaningful ways. 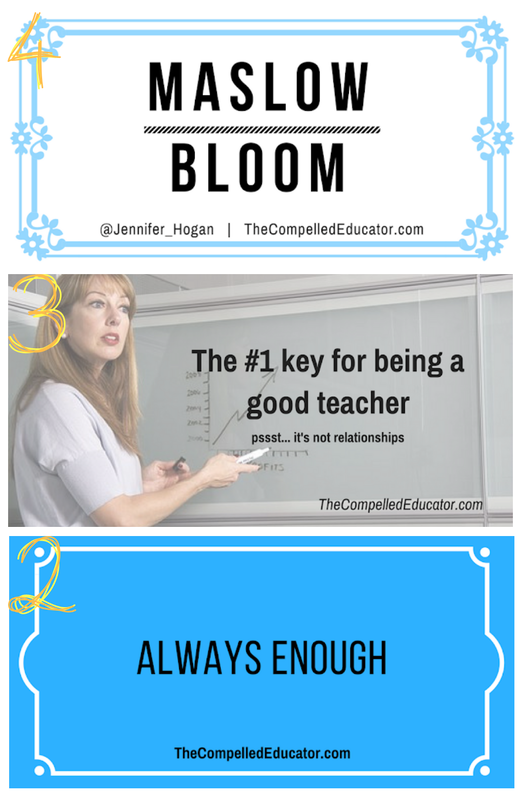 As educators, we should be working to build positive relationships with students and others. These relationships take time and consistent effort on our part. 2. Staying true to someone or something even when other things call attention. Being an educator is the best and hardest job in the world. 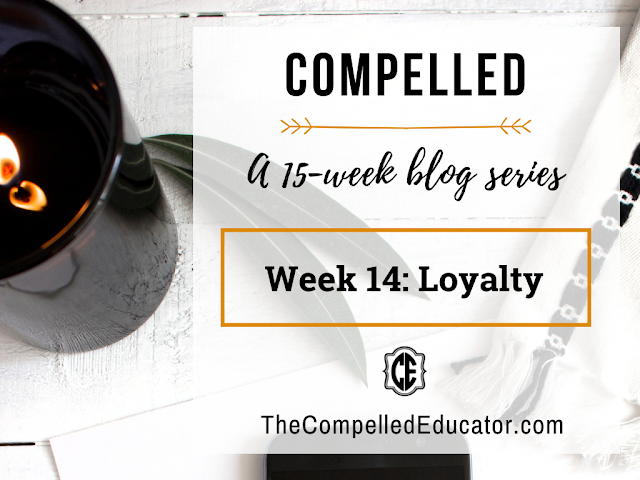 It's easy to get caught up in the busyness of our work, but loyal educators will keep the main thing the main thing. 3. A way of showing support for a person or thing. While it's easy to show support for the easy-to-love, compelled educators find ways to support ALL students. Do you stick with your friend, colleague, or partner when it’s not easy? Do you consider their circumstances as much as you consider your own? How do the questions above translate to what we do as educators? 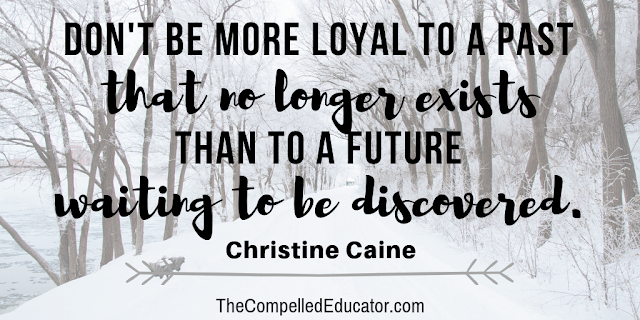 We must be loyal to students' needs and circumstances, doing all that we can to support their work and dreams. Additionally, we must be loyal to ourselves, making sure that we are our best selves for others. In what other ways do educators show loyalty? What other questions would you add to Sam's that are listed above? Welcome to week 13 of a 15-week series where I share quotes, examples, and/or stories about 15 of the characteristics that I believe are demonstrated by Compelled Educators everywhere. Enthusiasm as an educator is passion that grows from deeply connecting with one’s work. Enthusiasm for a subject matter is not enough, and enthusiasm for students is not enough (in my opinion.) 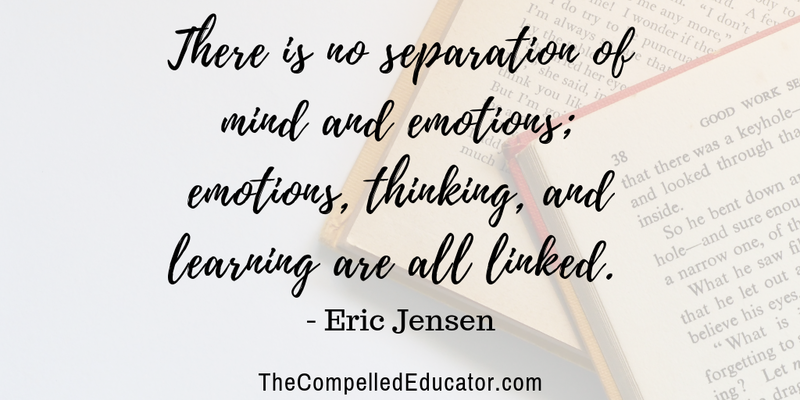 There must be enthusiasm for students, content, and for connecting the two through engaging lessons. 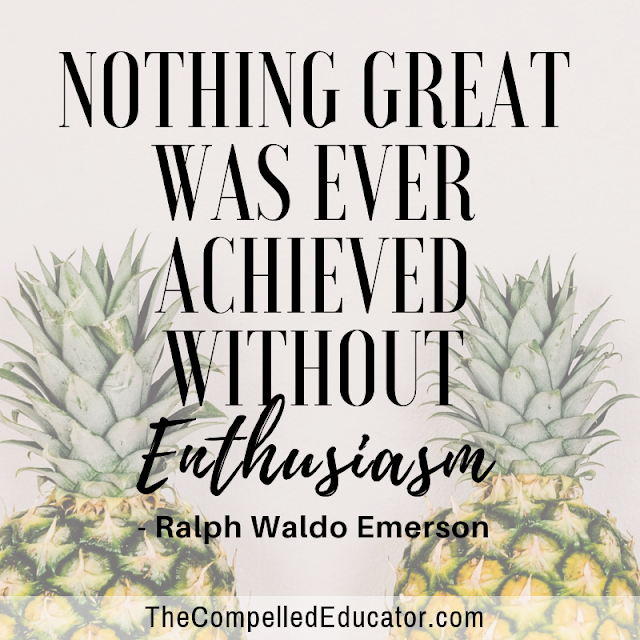 There is much research that points to the positive effects of a teacher's enthusiasm, especially towards the intrinsic motivation of a student. A teacher's enthusiasm is contagious and social, and students are more likely to be curious and interested. How do people stay enthusiastic during adversity? 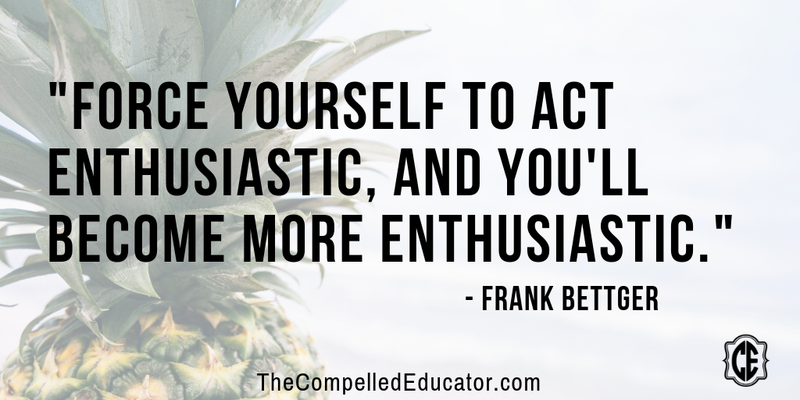 What behaviors must be modeled to demonstrate enthusiasm? What do great leaders do to build enthusiasm? What leadership mistakes dampen enthusiasm? How does perfectionism impact enthusiasm? The opposite of enthusiasm is _______. Why? How do you sustain enthusiasm? How does being enthusiastic help you? Others? What would you say to someone who thinks that being enthusiastic is just too much trouble? Want to be more enthusiastic? Here are three ideas that are simple, but not necessarily easy. 1. To become more enthusiastic, act more enthusiastic. This was the number one rule from former baseball player turned salesman, Frank Bettger. He wrote the book, How I Raised Myself from Failure to Success in Selling. 2. Avoid negative people and negative thoughts. Enthusiasm is contagious. A person's energy shows up before he even speaks. Curb negative thoughts by choosing not to dwell on things that can't be changed, and choose to forgive yourself when you make a mistake. 3. Take care of your physical health. This includes diet and exercise. Avoid too many sugary and fat-laden foods, and be sure to stay active. If you find these suggestions to be hard to do, enlist an accountability partner or coach to help you. Reach out to me on twitter, and/or share your journey with the hashtag #CompelledEd.